BUFFALO CHICKEN DIP BITES are amazing! 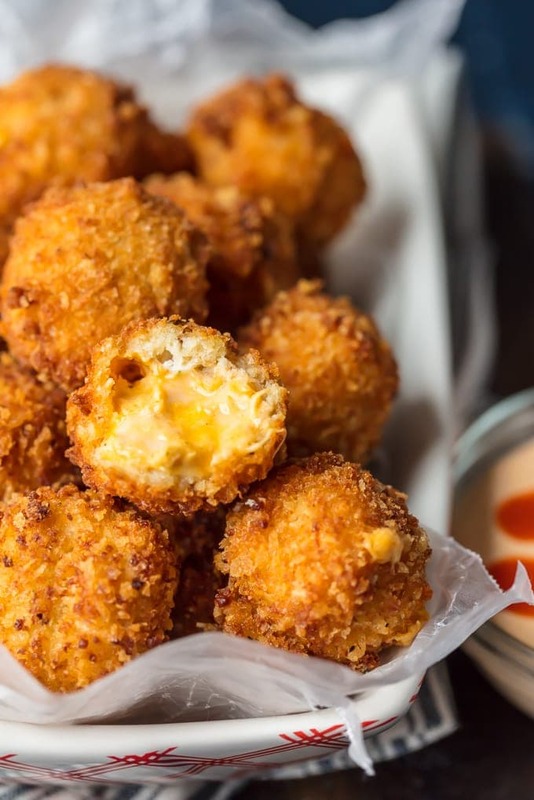 Deep Fried Balls of cheesy buffalo ranch chicken dip rolled twice in breading and deep fried to pop-able perfection. This is one of our favorite game day recipes for tailgating. Bring on the Buffalo Chicken Bites for Super Bowl or for any time you need a delicious and unique appetizer! These Buffalo Chicken Dip Bites are right up my alley. I seriously cannot get enough so I try to make every version I can possibly think of. Buffalo Chicken Sandwiches, Buffalo Chicken Enchiladas, Buffalo Chicken Pasta Salad, Buffalo Shrimp Tacos, and now Buffalo Chicken Dip Bites. Deep Fried Buffalo Chicken Dip is fueling my addiction. I have such a love affair with buffalo sauce. One of the first times I wanted to cook was when I wanted to learn how to make buffalo chicken dip for a Super Bowl party. I remember it so vividly…because I was SO helpless in the kitchen. I had to ask my friend Kathryn about 50 times to text me the recipe again. And I was legit scared to even try. And that wasn’t that long ago…I think it was 2010 or 2011. You guys…so sad HA! 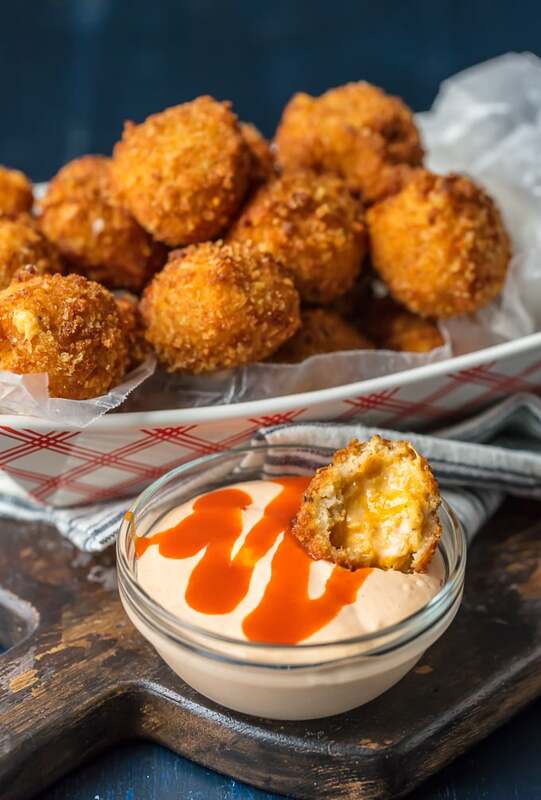 Annnyway, I have always loved buffalo sauce and these Fried Buffalo Chicken Dip Bites are such a fun twist on a game day favorite. If you love a spicy buffalo ranch chicken dip for gameday, this is such a great and unique option. 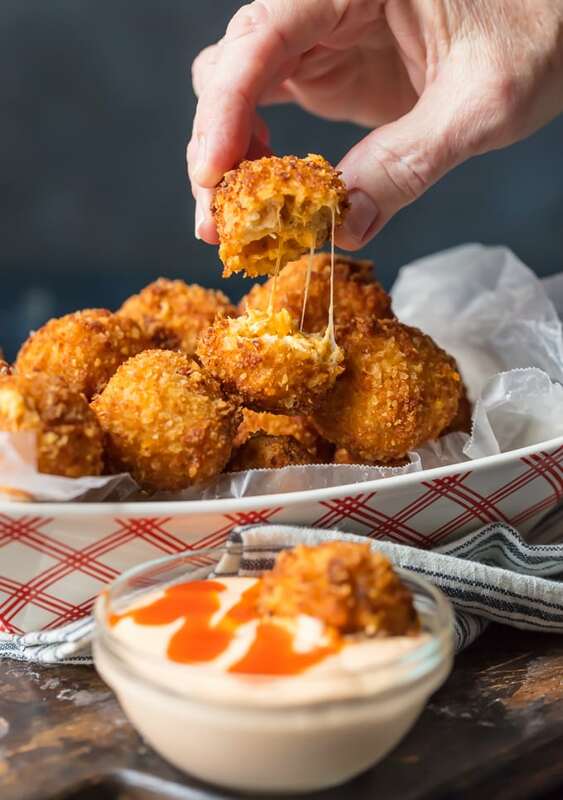 Buffalo Chicken Dip Bites were inspired by Mozzarella Sticks. I saw Buffalo Chicken Mozzarella Sticks on a FB Tasty video and knew I had to try my hand. I just had to. Mom and I got together and tested out the recipe and these delicious bites were born. We found the sticks to be too big and even after frying still had a frozen center. AMAZING idea but it didn’t quite translate into perfection. Making these Buffalo Chicken Dip Bites smaller and adding a double batter made them one of the most epic tailgating recipes we have made to date! Crispy outside, molten cheesy inside, buffalo chicken dip and mozzarella stick IN ONE! Obsessed. 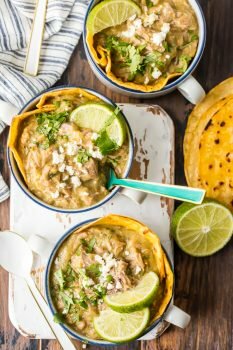 How do you cook chicken to be shredded for Buffalo Chicken Dip Bites? I used cooked rotisserie chicken for this recipe, but if you’d prefer to cook and shred your own chicken, it’s easy! Place your chicken in a skillet or sauce pan and cover with about an inch of water. Bring to a boil and then reduct to simmer for 10-12 minutes. When the internal temperature reaches 165F they’re done! Remove from water and heat and use two forks to shred. Then you’re half way there on this recipe! Can you make Buffalo Chicken Dip Bites and then freeze them? YES! These would freeze beautifully! Just make sure you seal them very tightly before serving. What do you like to dip these Buffalo Chicken Dip Bites in? I prefer ranch and Pat prefers Blue Cheese. We also love a mix of ranch and buffalo sauce if we are feeling extra spicy. 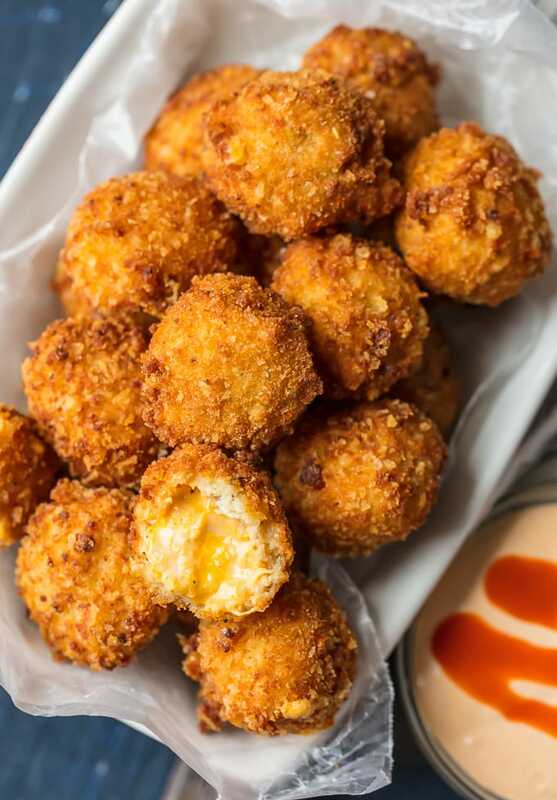 I could eat these Buffalo Chicken Bites for every meal. They’re so addicting. Dip them in ranch or blue cheese dressing for the ultimate treat! 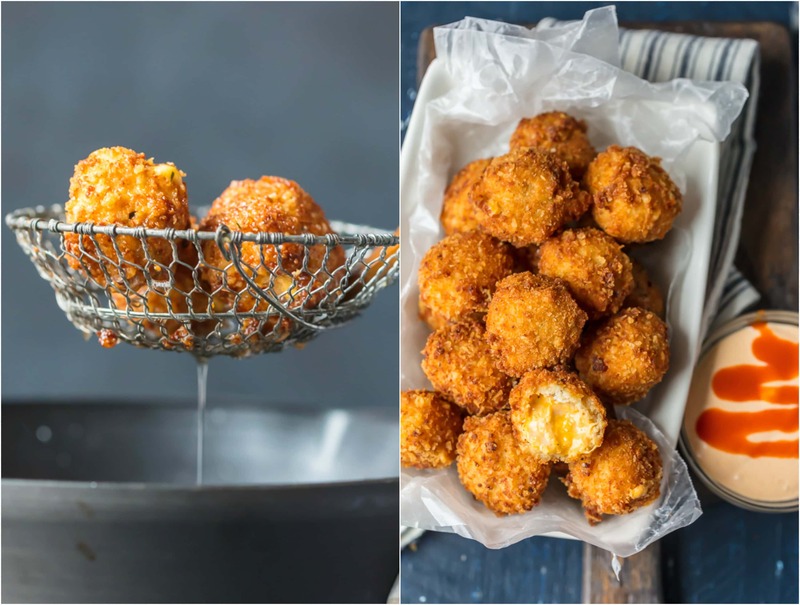 Each and every good tailgate party needs these Fried Buffalo Chicken Dip Bites. They’re just the right size, perfect when dipped in creamy ranch, and right up my alley. Which I hope means you will love them as much as I do. We tested and tried them until we think we got them just right, and I hope you agree! You better believe we’ve got you covered! You can always buy Buffalo Sauce at the store for this recipe, or you can make your own! Here is our favorite Homemade Buffalo Sauce Recipe. What are you waiting for? These Fried Buffalo Chicken Dip Bites are calling your name, I just know it! Get to deep frying! See the recipe card below for full details on How to Make Buffalo Chicken Dip Bites. Enjoy! Adapted from Tasty BUFFALO CHICKEN DIP BITES are amazing! 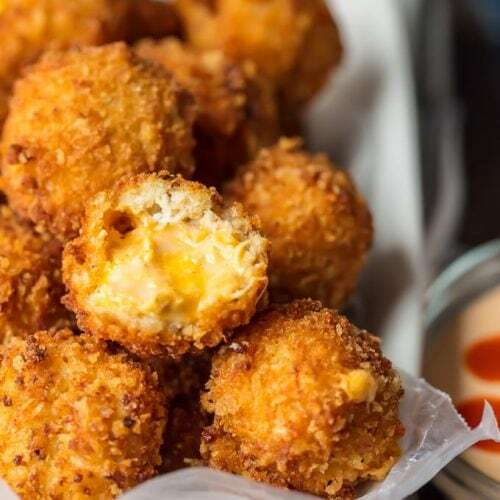 Deep Fried Balls of cheesy buffalo ranch chicken dip rolled twice in breading and deep fried to pop-able perfection. This is one of our favorite game day recipes for tailgating. Bring on the Buffalo Chicken Bites for Super Bowl or for any time you need a delicious and unique appetizer! Line a 6x6 inch dish with parchment paper. Cut the parchment paper 2 inches longer and wider than the dish, so the parchment paper hangs over the edges. In a large bowl, combine all ingredients up through the ranch dressing mix until smooth and evenly mixed. Press the mixture into the prepared 6x6 inch dish, and smooth the mixture flat with an offset spatula or a rubber spatula. Cover and freeze until solid or at least 1 hour. Remove the mixture from the freezer and cut into 1x1-inch squares. Set up three shallow dishes; one dish for the flour, one for eggs/milk (beaten), and one for the breadcrumbs. Dip each mozzarella bite in the flour (shaking off excess), in the egg/milk mixture, in the breadcrumbs, back in the egg/milk mixture and back in the breadcrumbs. Add more breadcrumbs or egg mixture as needed. Set the prepared mozzarella bite on a small tray until all are ready. While preparing the Mozzarella bites, pour 3 inches of oil in a medium-sized, deep saucepan and bring the temperature to 350°F. When oil is ready, carefully place 4 mozzarella bites in the oil and stir to keep separated. The bites are ready when crispy and dark golden brown, approximately 1 minute. Transfer to a clean tray. 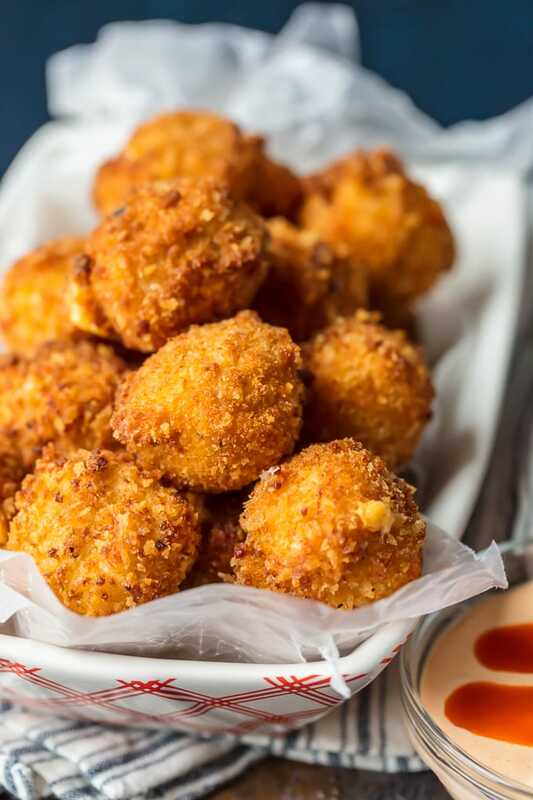 Repeat until all mozzarella bites are fried. Serve hot with desired dipping sauces or dips such as Ranch dip, Buffalo Ranch dip, Honey Mustard, BBQ sauce. These look AWESOME!! I need these in my life! Any suggestions on how to adapt this recipe to cook in the air fryer? So can you believe I’ve never used an air fryer??! I was just saying I wanted to buy one. I found THIS CHART that says for mozzarella sticks fry at 400f for 8 minutes. Since these aren’t frozen I’m thinking maybe like 5-6 minutes? Again I’ve never used one but that’s a pretty good guess. Hope it works, let me know!! Is there any reason you COULDn’t use the mixture sans THE coating as a dip or Spread for crackers? No frying involved. This looks awesome and I can’t wait to try it. I assume when you write add all ingredients together you mean up to ranch dressing mix? I also wonder how these would turn out if I tried to bake them. Thanks! You are so right! That needs to be edited, thank you! Just fixed it. I noticed that Step 2 says to combine all ingredients, which would include the flour, eggs, milk, and bread crumbs that you refer to in steps 6 and 7. I always read and reread recipes before making them just to be sure. THANKS FOR THE RECIPE BECKY! LOVE IT! 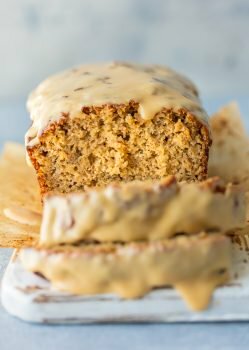 Is it me or are the bites in the picture round but the recipe says 1×1 square? Am I missing something? Please help!